Public Foundation "Development of Civil Society" within the framework of the UNESCO Participation Program for 2016-2017 conducted the Round Table on the theme: "Social integration of women through the art: dialogue and the development of artistic skills" on 12-13 June, 2017. Twenty participants attended the Round Table, including representatives of academic circles of Kazakhstan universities (KazNU, Kazakh-American University, Law Institute of the Almaty Academy of the Ministry of Internal Affairs of the Republic of Kazakhstan, department of UNESCO of Institute of Arts of the Kazakh National Pedagogical University named after Abay, the Caspian University, Kazakh National Academy of Arts named after T. Zhurgenova, KazNMU named after S. Asfendiyarov), the State Art Museum named after Kasteev, the Almaty College of Decorative and Applied Art named after Oral Tansykbaeva, boarding school No. 5 for children with hearing impairment in Almaty, school-gambling school No. 44 in Almaty, A. Kasteyev School of Fine Arts and Technical Design-UNESCO Club, representative of non-governmental organization “Kazakh Sociologist Society ", a member of the Commission for Women's Affairs and Family Demographic Policy under the akim of Almaty, representatives of the UNESCO Office in Almaty and a representative of the National Commission of UNESCO in Almaty. During the Round Table, the participants presented their research paper/ presentations on the on agenda’s issues. 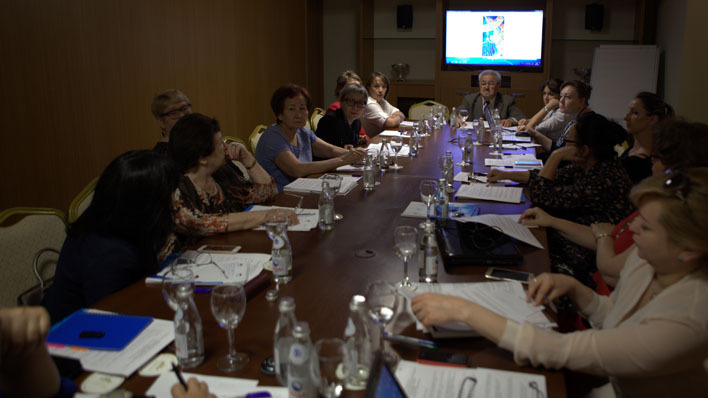 As a result of the Round Table "Social Integration of Women through Art: Dialogue and the Development of Artistic Skills", the following recommendations were developed. - To revive the subject of drawing and introduce it as a mandatory subject in the school curriculum. - Strengthening the role of creative unions - the union of artists, the union of composers, etc.